As temperatures rise worldwide, areas such as Siberia are suffering increasingly long dry spells. Russia’s national weather agency says the country is the fastest-warming part of the world. But Russia has taken little action to reduce its own emissions of the greenhouse gases believed to be behind the warming and at next week’s international climate conference in Paris it aims to push a proposal that would allow its emissions to increase. To Vladimir Churpov of Greenpeace Russia, the country’s leadership is obtuse and in denial. The issue is largely absent from public discussion and officials appear to give it only lip service, when they’re not sardonically dismissing it. 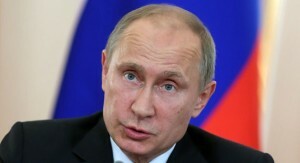 Leading up to the Paris conference, which seeks to implement the most ambitious emissions cuts ever, Russia presented a paradoxical pledge by promising to reduce its greenhouse gas output over the next 15 years by 25 to 30 per cent from what it was in 1990. However, 1990 saw a spike in industrial output before the Soviet industrial complex collapsed during the decade, causing a steep drop in emissions. So Russia’s pledge means it could actually increase emission levels by about 40 per cent from current levels by 2030. The 1990 emissions levels were the baseline for cuts in the Kyoto Treaty of 1997; that baseline is still used by many countries, including those of the European Union. By volume, Russia is the world’s fourth-largest greenhouse gas emitter after China, the United States and India, releasing more than 2 gigatons of greenhouse gases per year. But based on emissions per unit of gross domestic product, Russia is one of the most carbon intensive countries in the world, according to Shift Project Data Portal, an aggregator of climate change statistics; China, India and the U.S. aren’t even in the top 20. Russia’s chief climate negotiator, Oleg Shamanov, cancelled an interview requested by The Associated Press. Russia may be paying little attention to the issue because of the influence of the state-controlled oil and gas companies and the metallurgical industries that account for some 90 per cent of the country’s export revenue. “Because of the oil and gas lobby, climate and environmental issues are more often than not ignored by the government,” said Chuprov. At the Copenhagen climate talks in 2009, Russia also agreed to transition 4.5 per cent of its power sources to renewable energy, with national funding for renewable energy projects to start in 2014. This year, lawmakers postponed the program until 2024. Currently, 0.2 per cent of all Russian energy comes from renewable sources, excluding hydropower, says Greenpeace’s Chuprov. In a country where even recycling is a little-understood concept, there is little support and few incentives from the national government for Russian companies to switch over to green energy. “To get rid of the climate change, or at least stop it … they never find the money,” said Yevgenia Chirikova, an environmental activist who has left the country due to pressure from the government related to her work. One natural antidote for Russia’s emissions could be its carbon-absorbing boreal forests, which absorb approximately 500 million tons of emissions per year. Russian climate change negotiators have been pushing to include the forests in carbon emissions calculations, but critics say that including the forests’ carbon-offset would mean that Russia would reduce emissions only by 6-11 per cent by 2030. And scientists at the Russian Academy of Science warn that increased greenhouse gas emissions could negate the carbon absorbing effects of the boreal forests by 2040.